Do Ankle Weights Help With Basketball? The principle is a simple one. By wearing ankle weights, you will force your feet, ankles, lower legs and knees to work harder and build more muscle. By getting stronger in those areas, you will jump higher and run faster. 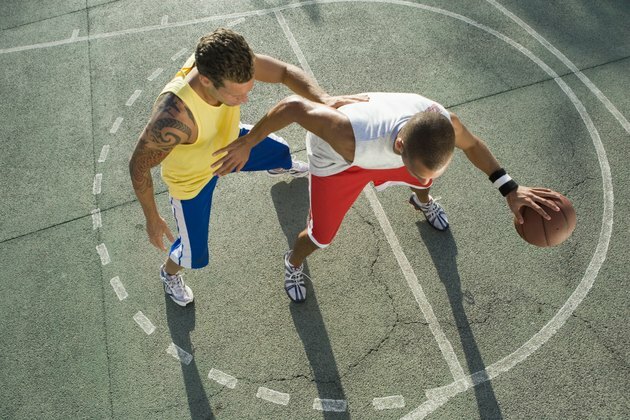 Those two factors will make you a more competitive basketball player. However, if you have any injury problems or don't warm up properly, you can put yourself at risk by wearing ankle weights. Don't go into a practice session and put your ankle weights on before you have warmed up properly. Do all your warm-up exercises before you put on ankle weights so you don't stress your feet or legs. Run the baseline drill, do jumping jacks and do a shuttle run. You may even want to scrimmage for a while. Once you are warmed up, you have a better chance of gaining leg strength and not getting injured while wearing ankle weights. The ankles are very vulnerable, and ankle weights must be light. Start off by wearing no more than 2 pounds on each leg. You can eventually work your way up to 5 pounds. Avoid programs that promise you huge gains if you wear 10-pound or 15-pound weights. Wearing ankle weights during practice sessions can help your muscles grow bigger and do it faster. If you wear ankle weights when you are walking, running, jumping or practicing, your glutes, hamstrings, calf muscles and quadriceps will work harder. Dr. Anthony Luke, assistant director of orthopedics and primary sports medicine at the University of California-San Francisco, in an article in the LA Times, thinks ankle weights produce positive results for basketball players. "It's giving a better workout for those big muscles," Luke says. The ankle is one of the most unusual joints in the body. Adding weight when you are exercising can cause the joint to work under very difficult conditions that could lead to injury. Kent Adams, director of the exercise physiology lab at Cal State Monterey Bay, believes ankle weights can cause stress on your joints and should be avoided. In addition to ankle pain, you can feel discomfort in your hips and knees; not to mention decreased speed during your game.